Hello Everyone! I am glad to be back after a long hiatus working on my book projects and taking those amazing ancient world night classes at Stanford. And what better way to celebrate my return than by announcing the publication of a book I worked on with author/illustrator Peter Linenthal! My new podcast will be out soon. The topic: Caesar’s Gallic War! 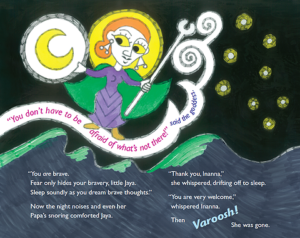 Little Jaya lives along the Silk Road in the first century CE and uses the powers of Greek, Persian, and Indian gods to gain courage to deliver a statue of the Buddha to the Kushan King Kanishka. Through the beauty of ancient coins, this spirited Gandaran tale highlights the spread of religious and artistic ideas in Central Asia. 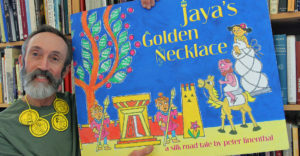 I worked on this book with Peter, a long-time friend and children’s book author/illustrator. 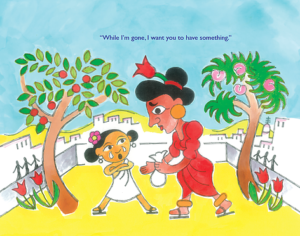 We’ve worked together over many years, attending conferences and workshops together as this book was developing. Jaya truly is fearless and her interesting historical setting deserves its place beside the other great empires of the ancient world. Check out Peter’s beautiful new book! 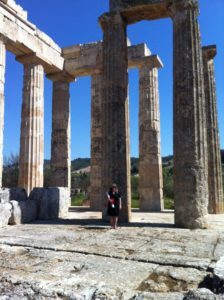 Our next stop on the tour was Nemea, the place where Hercules (Heracles) wrestled the lion. You always see Hercules with his club and lionskin. Stephen Miller, former director of the American School of Classical Studies in Athens and director of the excavations, gave us a tour of the site. 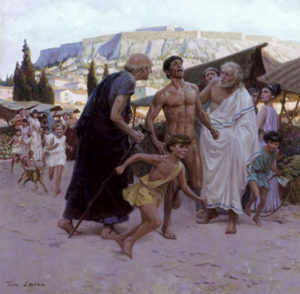 It has been his life’s passion to re-establish the Nemean games, one of the four Panhellenic games held in ancient Greece. 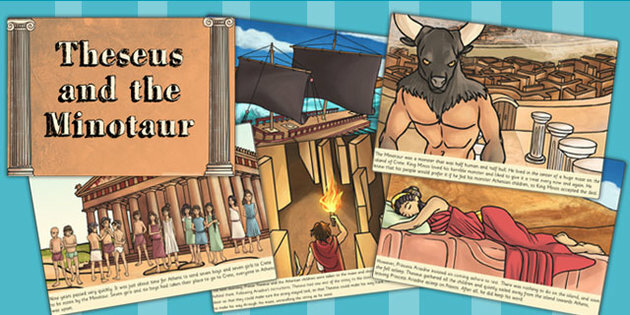 This summer will be the sixth annual games since they were ended at the site in the 3rd century B.C.! Miller is a graduate of U.C. Berkeley, and much help has been given by his alma mater and her graduates. 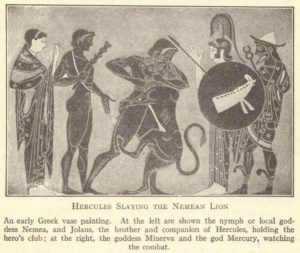 If you would like to run in the games or help support them, go to The Society for the Revival of the Nemean Games website. After all these years of reading Homer, Aeschylus, Sophocles, and Euripides, and marveling at Heinrich Schliemann’s fabulous discoveries, I finally made it to the Lion Gate at Mycenae! 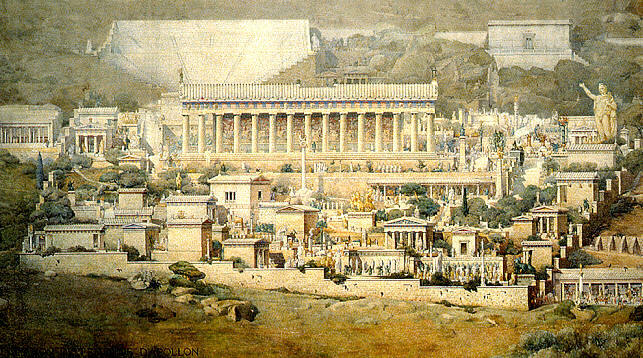 This place holds special meaning for me because the story of the Trojan War is my life’s focus, and its richness and depth continue to lead me in new directions. 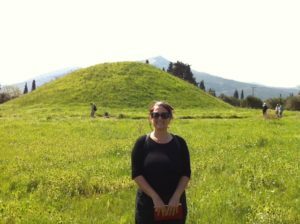 The Lion Gate is the main entrance to the citadel of Mycenae, which is on the hilltop behind me in this photo. 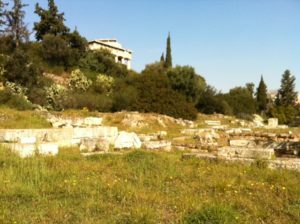 This is where Agamemnon, Menelaus, Achilles, Odysseus, Ajax, and the rest of the Greek warriors met to discuss their plan to get Helen back from the Trojans, and where Clytemnestra watched for the signal fires for her husband’s return from the war. 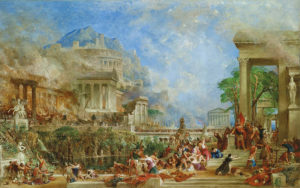 Agamemnon had no idea what awaited him, but Cassandra, princess of Troy and war prize to the king, wailed unabated as she was brought in to the palace. Shown below is the Tomb of Agamemnon, or the Treasury of Atreus, a beehive tholos built around 1250 B.C. : a massive structure. Bees actually inhabit the tomb and you can hear their buzzing hum when you walk inside. This land is layered in myth and metaphor; every hill and valley, stream and copse tells a story. I still can’t believe I am here. 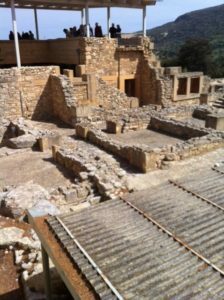 Before our visit to Mycenae we stopped to tour the fortress ruins of Tiryns. 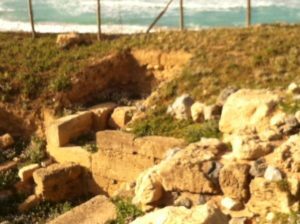 This site is where the term “cyclopean walls” originated, and in Homer’s Iliad, its epithet was “mighty-walled Tiryns.” Legend claims Hercules ruled here and that the walls were built by the cyclopes. Mycenae controlled the mountain pass into the plain, while Tiryns controlled access by sea. At the 4th century Theatre at Epidaurus, the first 2 scenes from my Iliad play were performed by some members of our tour group. Considered by scholars to be the best preserved theatre from the ancient world, it is a masterpiece of acoustical engineering and architectural proportions. Erika, from the audience, receives a copy of the play. I’ve always known about the great rivalry between Corinth and Athens, but I never fully understood why. After visiting the site yesterday, I understand. 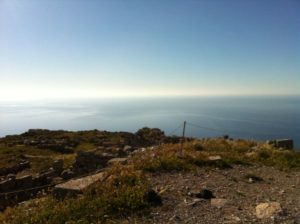 Corinth was a rich trading center with easy access to the sea. 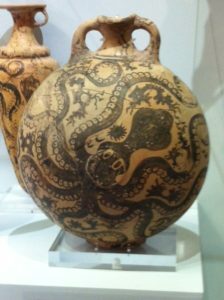 Its merchants travelled far and wide, and its craftsmen and artisans made some of the most beautiful pottery in the ancient world. 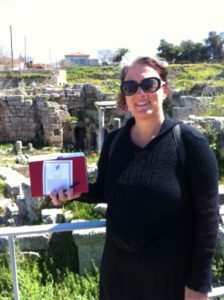 In the photo, Joulia Tzonou-Herbst, Assistant Director of the excavations at Corinth, who gave us our tour, shows us a curse tablet made of a wafer-thin piece of lead dated to 72 A.D. Curses were written down and placed inside sanctuaries to elicit the aid of a god or goddess to do horrible things to enemies. This curse tablet has the worst curse I’ve ever heard! next to it you can hear the water rushing through the channels and cisterns and subterranean stone ducts, as if a rushing river were coursing through. In the painting above, you can see the fountain and a statue of Pegasus.On the slip of paper I hold is an image of Pegasus, whom I’ve loved since I was a child. 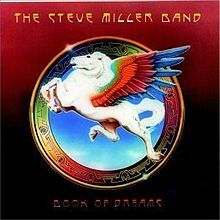 I became a fan of the Steve Miller Band when his Book of Dreams album featured Pegasus. 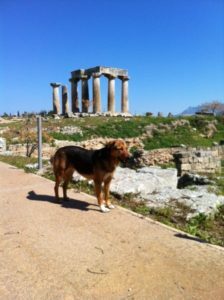 The dog is posing in front of the lovely Doric temple of Apollo here in Corinth. 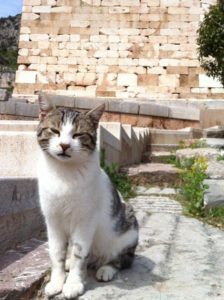 There are dogs and cats living at all of these archaeological sites, and they are very popular with the visitors! HELLO ROOM 5! This section is addressed to you! Food I Ate Today: Grilled sardines—amazing!!! Not at all like the sardines in a can! I Wonder: I wonder what it is like to ride a horse that flies. Lesson and Activity: Draw Pegasus! Notice how the feathers of his wings are arranged. Yesterday we hiked five miles to the top of Mount Ida, the highest peak on Crete, where Zeus, in some stories, was born, and in other stories, was raised. It was also called the Philosophers Cave & it is said to have inspired Plato to write his Allegory of the Cave. We carried a couple of oak branches up the mountain because the oak is a symbol of Zeus. Our professor read from the ancient historians and told us the Seven Sages of Greece, Pythagoras, Plato, Epimenides (who, while tending his father’s sheep, fell asleep in the cave for 57 years! 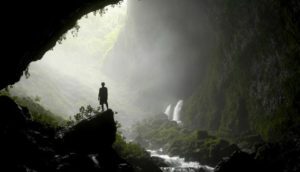 ), and many other ancient seekers of wisdom were said to have visited the cave. 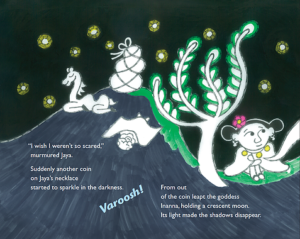 I saw a goat up in a tree browsing on the leaves, and the sky was dramatic with heavy black clouds, shafts of light, and fluffy cumulus. 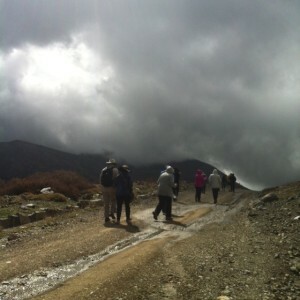 There was snow in patches close to the peak, and hail fell from the sky when we stood at the mouth of the cave. Earlier in the day after a stop along the road, we met a Greek Orthodox priest of a village church who said, “The place where you are going is sacred.” The gate was locked, so we couldn’t go into the cave, but this image is what I imagine it looks like inside. At day’s end we visited the Minoan port of Amnisos. The Karteros River, which begins on Mt. Ida, meets the sea here. 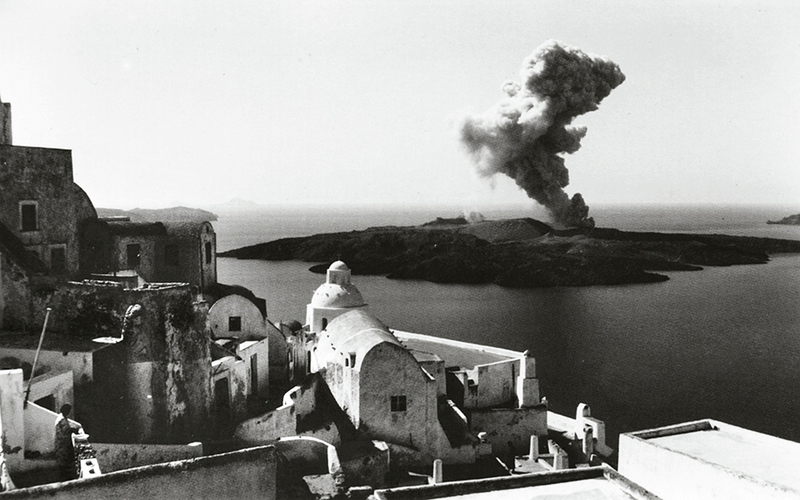 The volcanic eruption of Thera in 1620/8 B.C. sent a 50-foot tidal wave to Crete and destroyed the Minoan fleet, the compression force from the wave being so great it left the imprint of each ship in the sand. 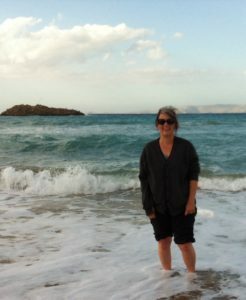 Finally, just before leaving the site, I got to dip my feet into the same water in which the Greek ships sailed on their way to Troy—and the same waves that tossed Odysseus up onto Nausicaa’s beach. Another magical day in this enchanted land. Today, we visited a Minoan site called Vathypetro that holds the distinction of having one of the oldest vineyards, olive orchards, and winepresses in the world. 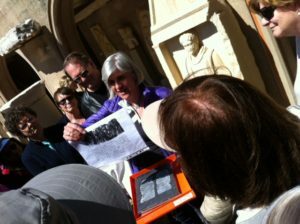 The site dates back to at least 3,500 years ago. 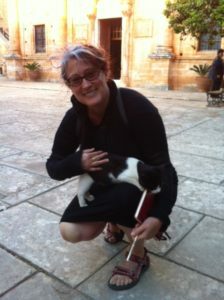 Later, we visited a Greek Orthodox monastery where I met a new friend I wanted to bring home to California. Yesterday we flew into Crete, the island of the Palace of King Minos and his Labyrinth. 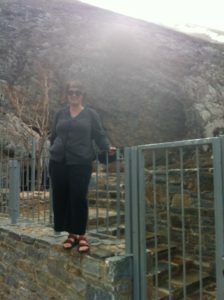 After dropping our luggage off at the hotel, which looks out over the sea, we visited Anemospilia (“cave of the winds”) on Mt. 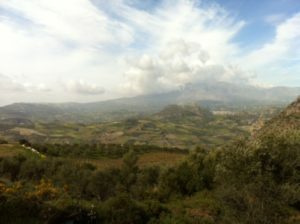 Juktas, the site of a temple, thought to have been destroyed by the volcanic eruption on Thera in 1620/8 B.C. 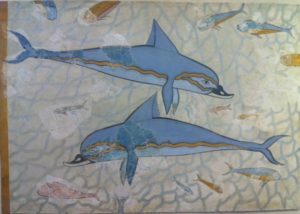 At the Heraklion Archaeological Museum, we saw the finds that were found on the site and the famous frescoes and objects from the palace at Knossos. 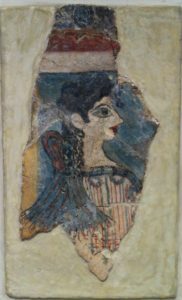 And finally, this morning we went to King Minos’s palace, discovered and excavated by Sir Arthur Evans, The “Throne Room” with its griffin fresco is one of the most well-known images in archaeology. What an “amazing” experience to walk through the halls and across the courtyard of this iconic palace. 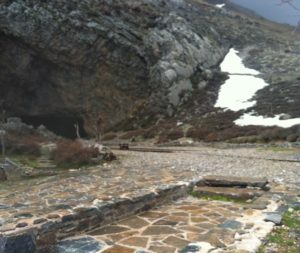 Strangely enough, the site was closed suddenly when gale-force winds of 50 miles per hour caused injuries to visitors. 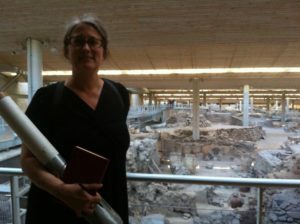 We lunched at a new restaurant called Pasiphae, named after the queen of Knossos and wife of King Minos. 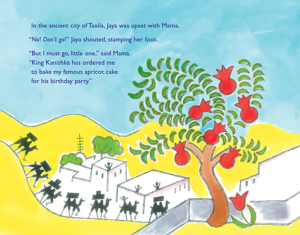 Professor Hunt & his team had arranged for a Minoan feast with foods from the ancient island. 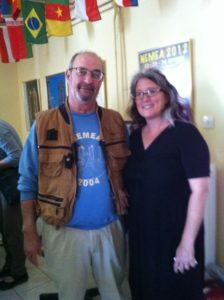 The food was delicious and fresh, with island ingredients such as dill, barley, coriander, olives, sesame seeds, honey, and mint. 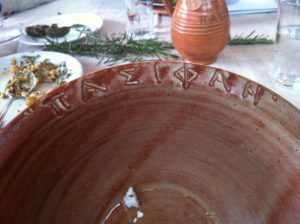 The pottery from which we ate and drank had Linear B inscriptions (Linear A and Cretan Hieroglyphs haven’t been deciphered yet!) and was especially made for us. 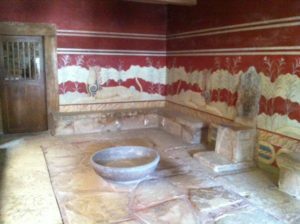 Painted on the chairs were Linear B words for various occupations like goatherd, charioteer, and assistant to the temple. 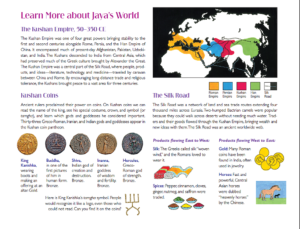 The beautiful placemats had the family tree of King Minos and the Linear B translations for the occupations. My chair inscription read “local leader.” The crowning glory of this extraordinary experience was a translation of all of our names into Linear B by a professor who joined us just for the occasion! 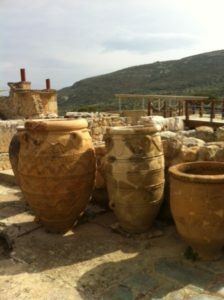 Our day ended with wine tasting and a tour at Boutari, for wine-making on Crete dates back nearly five thousand years! 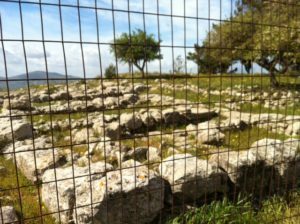 The Labyrinth, where King Minos kept the the half-man, half-bull Minotaur, was built by the great craftsman Daedalus, who was also famous for making a pair of wings for himself and his young son, Icarus. 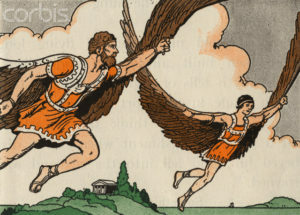 Icarus, in his excitement, disregarded his father’s instructions, flew close enough to the sun to melt the wax that held the feathers together, and plummeted into the sea. A garbanzo bean salad with barley, sesame seeds, coriander, tomatoes, feta, and sardines. I Wonder: I wonder what the sesame plant looks like. Lesson and Activity: Do you see the street sign? It has the hero’s name on it: Theseus. What do the street signs in your neighborhood say? Talk to your family about what they mean? 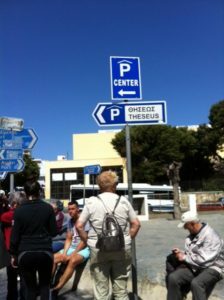 On the way to Delphi today we stopped at the place where Oedipus and Laius met on the road. 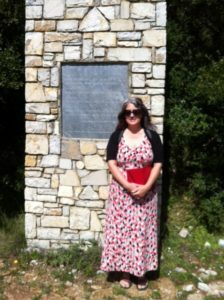 It was amazing to stand where such an important event in mythology occurred. Here is my Achilles helping me write a section of my book that never made it to print. 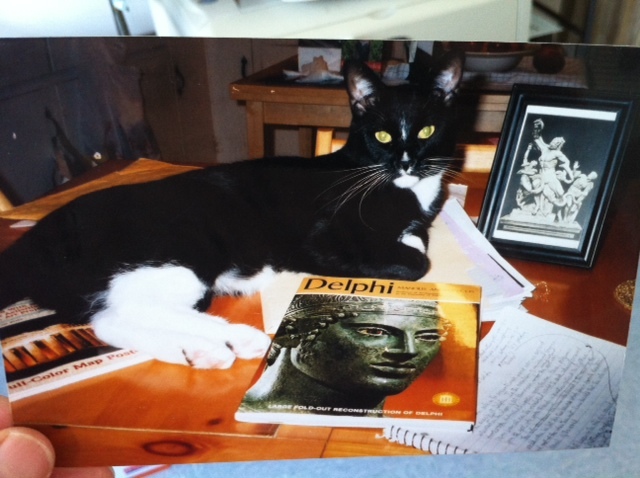 It was about the oracle at Delphi . 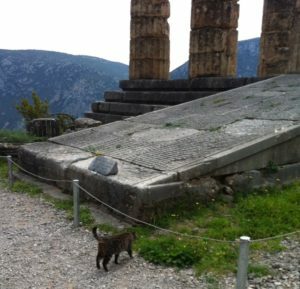 To honor my dear old friend today, I took one of his whiskers and left it at the Temple of Apollo. 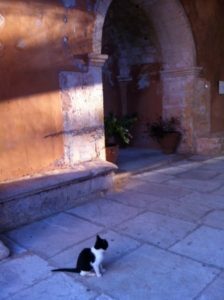 I picked the spot because there were a couple of kitties sunning themselves on the marble and I knew Achilles would have loved to join them there. 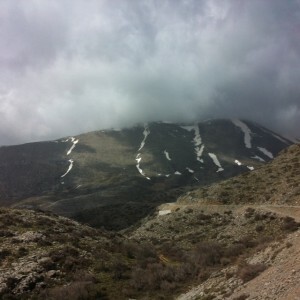 The mountain in the photo is Mount Helikon and was where Pegasus lived for a long time. He struck his hoof on the ground there and a freshwater spring gushed from the earth! 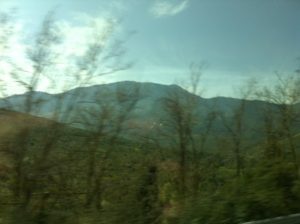 Today I went up into the mountains and visited Delphi. This is where Zeus’s two eagles met and so it was said to be the center of the world. 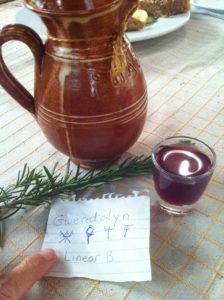 People in ancient times would visit this place to get their fortunes told. 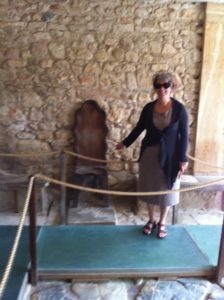 The lady sitting on the stool was a priestess of Apollo and would answer a question for a visitor. It was very religious to them and she was greatly respected. Famous leaders and warriors visited her. 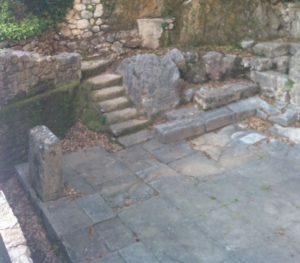 The photo to the left was where the priestesses and visitors would wash up before going into the sanctuary of Apollo. Fresh spring water comes down from the top of the mountains here and this was also where the Muses lived. 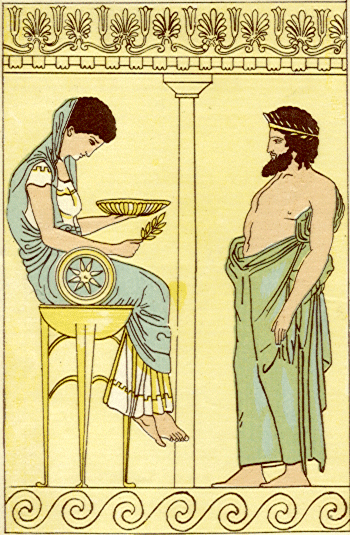 The Muses are the goddesses who give people inspiration in music, literature, and all the arts. I drank water from the spring and washed my hands in it, hoping the Muses would help me be a better writer! 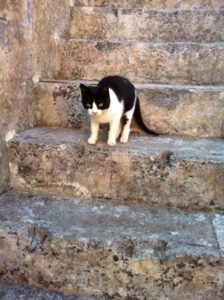 I Wonder: I wonder who feeds the kitties at these ancient ruins. 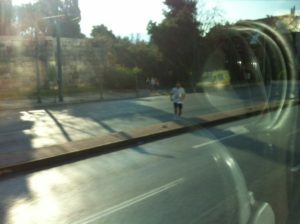 Today started with Athens cordoned off for the annual half Marathon, with the starting and finish line right outside the hotel. So fitting for the day when we were to visit Marathon, I thought! 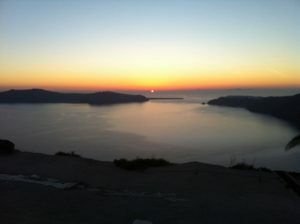 But everything, I have discovered, on this magical trip has been planned intentionally, down to the breathtaking Vernal Equinox sunset at the Temple of Poseidon at day’s end. Our first stop was the ancient Agora, where law courts, temples, shrines, shops, a library, and performance spaces were built to accommodate the lively daily business of Athens. Most important of all citizen activities was voting, for it was here, in the Bouleuterion, where we find the very birthplace of democracy. Here, the great orators spoke to the people in support of various issues of concern to the community. 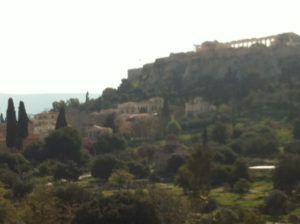 Here, at the Bouleuterion, Miltiades proposed his plan to head off the Persians at Marathon. Citizens voted in favor and headed over to the arsenal where officials distributed the weapons the citizen soldiers carried through the mountains to the coast at Marathon. Later, at this very spot, Pheidippides collapsed in front of the people, gasping in his last breath the message of victory. Our tour continued over to the battlefield where the 192 who fell defending their cultural and community lie beneath the soros (burial mound) at Marathon. Why was this battle so important? Because if those brave citizen soldiers had failed in their endeavor, democracy, that unique experiment in community governance, would have been extinguished under Persian subjugation and Western civilization as we know it would have a very different shape. 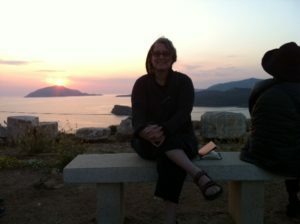 We ended our day at the Temple of Poseidon at Sounion, high on the cliffs above the Aegean. 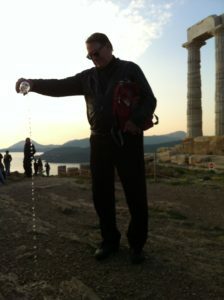 Professor Patrick Hunt, our leader, poured a libation (from bottled water!) to the god of the sea as the last rays of sun shot through the clouds on this first day of spring. 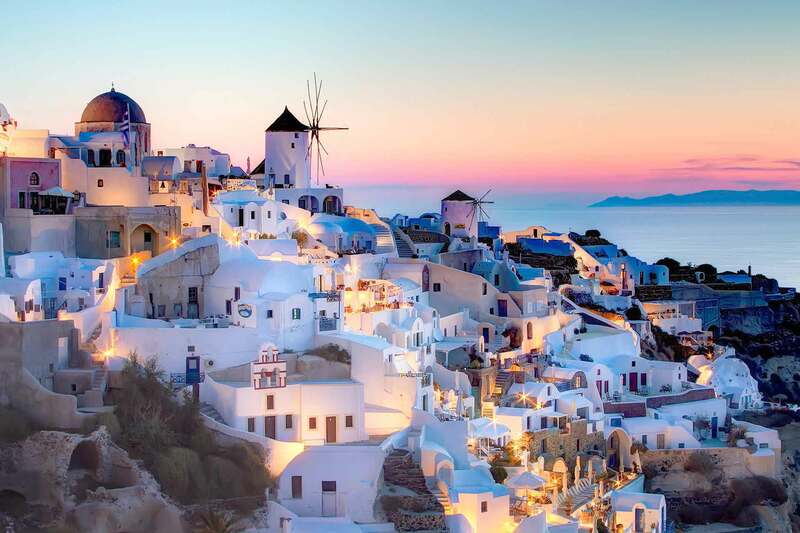 Menelaus, on his way home from the Trojan War, stopped here, and King Aegeus, the father of Theseus, waited here for news of his son’s quest to slay the Minotaur. A truly mythical end to a significant day! Food I Ate Today: Baked feta (sheep’s cheese) with tomatoes and onion. I Wonder: I wonder how cheese is made. Lesson and Activity: Voting in America is a very important duty. Find out how we vote and what it takes to cast an informed vote. 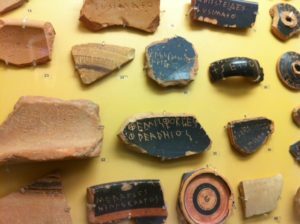 Here is a photo of ancient Greek ballots: they scratched their choice onto pot sherds.